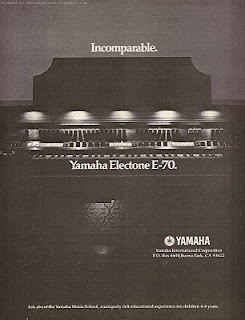 Yamaha Electone E-70 organ advertisement from page 23 in Contemporary Keyboard Magazine September 1979. First time this ad ran, it was in black and white. All following ad runs were in color. Not sure which I like best. It looks like they bumped up the brightness a bit in the black and white version, so you can make out more detail. But, this advertisement isn't really about detail. In fact, they include virtually no ad-copy about the organ at all. So, the colour version, with its soothing mood lighting, appeals more to my eye. In the end, the ad ran so infrequently, I'm not sure if it had much of an effect. It seems to have first appeared in CK in September 1979, fourteen months after the first E-70/E-50/E-30 ad ended. And it ran only four or five times between September '79 and January '81. 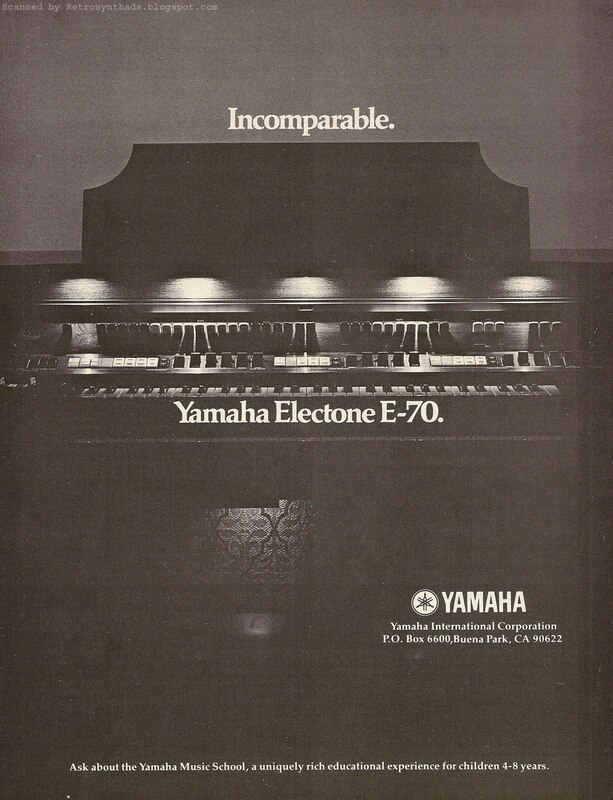 AND, in at least one of the issues it was featured in (February '80), Yamaha had FIVE ads running, so it probably got drowned out by their other ads as well. But, none of that really matters, because my interest really isn't in the E-series ads (especially this one that has no reference info at all). My curiosity about these organs is all about my recent discovery that the E-series apparently has some things in common with the Yamaha CS-80. 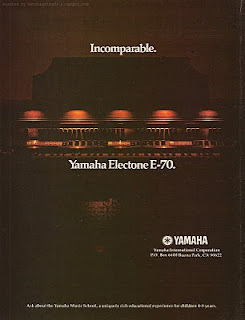 I had known about the connection between the Yamaha GX-1 and CS-80, but had never run across anything about the E-series/CS-80 connection. As explained in my last blog post, this surprise first grabbed my attention in some rather recent comments on the CS-80 page at Vintage Synth Explorer. Commenter "FlameTopFred" was the first to start mentioning this connection on the page in January 2011. After reading this, I started doing a bit of research, and it seems that the connection between the CS-80 and the E-70 didn't really gain traction online until somewhere around 2008. And, it appears that we can thank "FlameTopFred" for sharing a lot of that information with the synth AND organ communities. It took a few minutes, but I soon hit gold. I found "FlameTopFred"'s initial E-70 purchase and a nice exchange of information on organforum.com where he first started posting back in 2008. "Funny sometimes, to think how many times as a surly teenager I walked quickly past the organ shop in the mall, or turned my back to the Yamaha Organ booth at the harvest fair at the end of summer ... if only I could go back in time with a bag of moneyand a large truck . . ."
Others started catching on to this apparent connection too. "Dr. Funk" half-jokingly comments on the same forum about the effect that "FlameTopFred" had on E-series prices. "Through recent heavy research and after having stumbled on an amazingly good deal on an Electone D-85, am now convinced that the Yamaha E-70 is in fact 90% of the famed CS-80 synthesizer. I used to own two of those, and always felt the need for a 2nd keyboard ~ which the E-70 provides for playing bass lines and comping chords." "I used to own two CS-80's as well, and then owned the E-70 and E-75. The E-70 was designed and made the same year as the CS-80 - - both direct children of the GX-1 testbed. The E-70 has the same electronic engine, and if you replace resistors with potentiometers on the preset board, becomes a CS-80 synth. No - - not totally identical. The E-70 offered dual banks of sound (couple-able to upper keyboard), plus bass﻿ mono synth, drum machine and arpeggiator. ﻿ Great package. Turns out, the E-70 in that video was destined for the dump until VintageKeyStudio came to the rescue. They created a page on their Web site/blog dedicated to this "poor man's Yamaha CS80". A fun read. 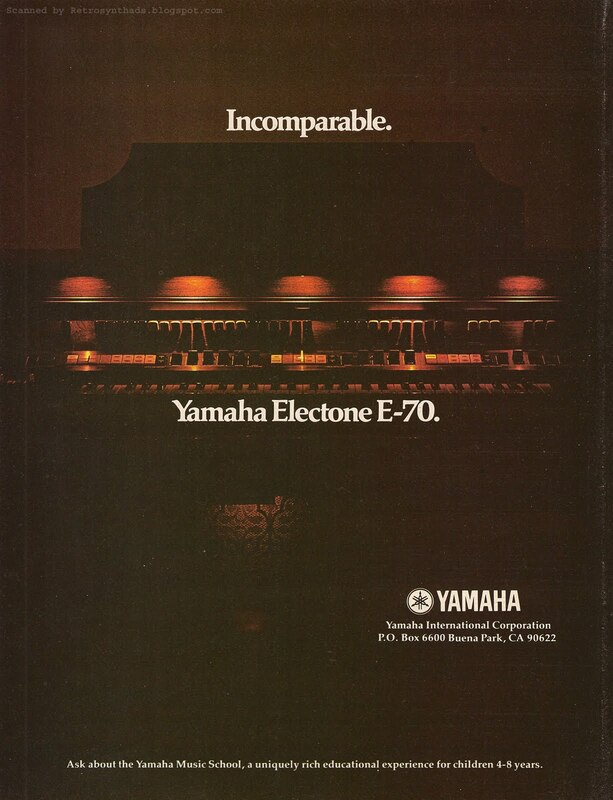 The page also linked to some good photos of the organ on an Electone history/summary site. And, if you scroll to the very bottom of the page, you will find this: "2010 Mike Thompson". Mike Thompson was the name of another one of the recent commenters on the Vintage Synth Explorer page that originally started me on my E-70 discovery/journey! Interestingly, I couldn't find any real information on the E-70/CS-80 connection prior to posts by "FlameTopFred". For example, nothing came up in my few quick searches through the Analogue Heaven archives. But then again, I didn't dig too deep. I did find one weak reference from a February 2000 Sound on Sound article where Gordon Reid mentions the Electone connection with the GX-1. I recently tracked down "FlameTopFred"'s email address and sent him a few questions, and I just noticed an email back from him in my in-box. Excellent.